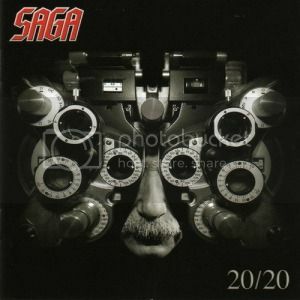 Canadian prog-rockers, Saga, are back with 20/20, their first album since the return of original vocalist, Michael Sadler. Like The Beach Boys before them, 20/20 refers to the fact that it is the band’s twentieth studio album (The Beach Boys included compilations in their tally), but it has a double meaning as well, as keyboardist/vocalist Jim Gilmour had eye surgery during the band’s most recent European tour leaving his vision, you guessed it, 20/20. The album opens with the pulsating synths of “Six Feet Under” before the full band kicks in on this melodic rocker. The track features a call and response vocal on the verses with a strong, impactful chorus. The musicianship is top notch with intricate guitar and keyboard lines throughout and explosive drumming from Brian Doerner. “Anywhere You Wanna Go” is a groove-oriented track that recalls bands such as Dream Theater (who may very well have their own Saga influence) with its heavy riffs and powerful chorus. Guitarist Ian Crichton plays a short, but memorable solo and Sadler offers a strong vocal performance. The band slows down the pace on “Another Day Out Of Sight,” a melodic ballad drowning in lush keyboards and wah-infused leads from Crichton. Similarly, the band goes into mellow mode with the dreamy “Ellery,” with its acoustic guitars and keyboard backdrop. On “Ball And Chain,” the band manages to add a prog edge to an otherwise pop track. It’s a memorable song, filled with hooks and fine musicianship. The band really stretches out musically on album-closer “Till The Well Runs Dry.” The song starts modestly, with a simple keyboard and vocal figure before building in intensity, showcasing some of Crichton’s best guitar playing and powerful vocals from Sadler. While Saga may be best known in the United States for the track “On The Loose,” they’ve continued to make music and tour. With the return of Sadler on vocals, the band shows it has lost none of its potency on its latest release, 20/20.